My cousin's husband, Rabbi Levi Deitsch, Shliach to Tysons Corner, Virginia, tragically passed away on Shabbos after a 3 year battle with cancer. He was only 34 years old and he left 4 beautiful children, a grieving family and community and thousands of friends and admirers. He also left a legacy of faith and courage. He had an indomitable will to continue living in the face of tragedy and an incredible ability to respond with humour to illness and suffering. Though we were casual acquaintances for a few years before he married my cousin and I managed to spend some time with him occasionally in the ensuing years, only now, after he’s been taken from us, do I realise that I never really knew him. I thought I knew him; I thought I had him placed. A big, blustery guy with a loud voice and forceful character, he was known for his cheerful disposition and ability to make friends. The life of every party and the centre of every conversation, he attracted people into his vortex just by force of personality. But in the days since he passed away I’ve been exposed to a much more complex persona than the superficial picture I had formed of the man. From my sister who spent many months living in the Deitch house and from various tributes and memories that have been posted online I have learned to appreciate Levi as a person, a father, a chassid and a true leader. I learned about a man who could demonstrate such kindness and sensitivity that he became almost a second mother to a newly bereaved child in his community. He spent untold hours counseling those in need and consoling those in pain. I heard about vulnerable people who he befriended and acts of pure compassion that he displayed so often, to so many. He was a man who could reawaken his extended family’s faith at a time of tragedy and, by sheer willpower, he would keep on keeping on in the face of appalling pain and medical setbacks. Which was the real Levi, the boisterous practical joker with the booming laugh or the sensitive man of faith who consistently put other people’s needs before his own and skillfully concealed his own sickness and losses in his effort to protect others? We read this week about the long-awaited confrontation between Ya’akov and Esav. For twenty-two years Esav had nurtured his grudge over the usurpation of their father’s blessings and had planned his murderous revenge. In preparation for the meeting Ya’akov sends Esav a message. Rather than apologising for the past, he describes to his older brother the wealth he had accumulated in the years since they had last met: I have oxen …. and flocks…. (Vayishlach 30:6). Apart from the obvious question why Ya’akov would choose to resume his relationship with this topic, the Lubavitcher Rebbe queried why Ya’akov first described the cattle he owned and only subsequently mentioned his sheep, when in actuality he had many more sheep than cattle (see VaYeitzei 30:43). In a fascinating insight into various personality types, the Rebbe (Likutei Sichos 15:252-258) posited that sheep and oxen actually represent various temperaments and dispositions. Oxen are loud and boisterous, strong bodied and determined. They are valued for their willingness to work and are endlessly productive. Sheep, by contrast, are more docile and accommodating. They are naturally submissive and humble in spirit. They mill together in large family groups of mutual support and bleat in sympathy at the sorrow of others. A well rounded personality needs to demonstrate both character traits at alternative times. Rather than being contradictory, they are actually complimentary. When setting out to conquer the world for G-d or create a community from scratch, you cannot afford to be shy; you must be prepared to knock on stranger’s doors and become their friend; crash through people’s defenses and actively make an impact on the lives of others. However, at heart, a Jew must remain humble and sincere; accommodating and friendly, open to self-reflection and willing to change. The true path of our ancestor Ya’akov and those who would follow in his way, is to be sensitive to the needs of others and to be willing to sacrifice oneself to a greater calling. Ya’akov first spoke of oxen and only then introduced the sheep motif when confronting the challenge of Esav. This demonstrates to us, his heirs, how best to approach the world. Although at essence he was really a sheep, he stood up to Esav by first summonsing the more forceful, ox-like characteristics at his disposal; overcoming him with strength and passion and only therafter did he allow the milder, more welcoming side of his personality to shine through. This was the lesson we learned from Ya’akov and these characteristics of a fully formed personality, I believe also apply to Levi. Though at first one was most impressed by the force of his personality and the warmth of his manner, the true greatness of the man was his caring concern for others. 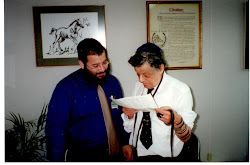 Rabbi Levi Deitsch will be missed by his community and friends. His wife and children have been robbed of a truly special man and we are all the poorer for his loss. However his ability to combine strength and sensitivity, energy and humility, and friendship and sympathy will live on forever in the memories of all who knew him and loved him and especially those who were touched by his unique gifts that he so freely shared with others.